Paying for parking? There’s an app for that. Or at least there should be. Walking down a downtown sidewalk this week, I pondered a sawed-off pipe near the curb where an old-fashioned parking meter once stood. 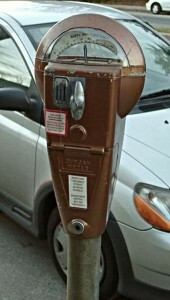 A few years ago, the City of Raleigh got rid of all the traditional coin-based parking meters and put up new electronic parking kiosks instead. Drivers simply note the painted number for their parking space and enter that into the kiosk along with their payment. Simple, right? Instead of collecting coins from hundreds of meters, parking staff simply empty the money from kiosks, which take credit cards and paper bills in addition to coins. Drivers can also refresh their parking time from nearby kiosks, avoiding a trip back to the kiosk nearest the car. On my bike ride yesterday, I pondered what the trees might teach us. As I rode through piles of freshly-fallen leaves, it occurred to me that we are closer to trees than we think. Our human souls shed bodies the way trees shed leaves. Pretty powerful stuff. So there’s your Sunday sermon! Where did we get the phrase “laundry list,” and how did this phrase gain the meaning of “a long and often tedious list of items?” I mean, I know what a laundry list literally is, but there were other lists long before before laundry lists. How did a list of laundry become the go-to list when trying to describe a long list? Is it the alliteration? Doesn’t it seem weird to be at the office and referring to laundry when describing a list of items, especially when most people wash their own laundry? I hate keys, as I’ve written about many times before. I also hate keycards, and thought it was ridiculous that my office suite requires two separate keycards: one for the building and one for the suite. Yet in my pocket is a miracle of computing and communications power: a smartphone. My smartphone knows my identity when I swipe the security code to unlock it. It’s capable of very strong encryption and decryption. Why can’t I use my smartphone as a key to unlock my office doors? It sure would be more secure than relying on ancient technology like tumbler locks and keys. Update 9 April: My friend Steve sends me links to the UniKey and the Lockitron, both of which are very, very interesting! Remember last year when I wondered when someone would start building roads made of solar panels that generated electricity? I found out today that someone actually is doing this. Pretty cool! via Solar Roadways – Introduction. Speaking of working from home, we have an arrangement here at work that is a pretty interesting use of telepresence tools. One of our developers works remotely but needs to attend occasional meetings. Rather than fly him in and out, we’ve set him up with a Wifi-enabled camera which he can use to pan, tilt, and zoom around the room. All that’s missing is some way for him to drive the camera from room to room and he could be virtually here. The camera isn’t cheap but it easily paid for itself the very first time it kept our developer from traveling. I was thinking of bringing in my now-unused Roomba vacuum and using that to move the camera around. I could slap a small UPS battery on top to power the camera and interface it with the camera software to let it be controlled remotely. Another thing that would be useful to telepresence tools would be an additional fisheye-lens camera. This should show the whole room in a separate window while the main camera is pointed somewhere else. When the viewer needs to focus on something or someone in the room, the viewer will know where the main camera needs to be pointed. Better yet, the viewer could simply click on a point on the room image and the main camera would point there. That might make it painless enough that attending a meeting virtually wouldn’t be so much about fiddling with the tools but being able to focus on the meeting itself. Interesting stuff. I’ll have to see what I can put together to make this work. Isn’t “uninstall” a clumsy word? If there’s an “uninstall,” shouldn’t there be an “outstall” or a “destall,” too? The family spent a few hours setting up our Christmas tree yesterday. It took a lot of time, from sorting out the parts (it’s artificial) to stringing the lights to hanging ornaments. It got me thinking how nice it would be to have a tree that folded up like an upside-down umbrella. I mean, if you’re going for an artificial tree, might as well add convenience, right? 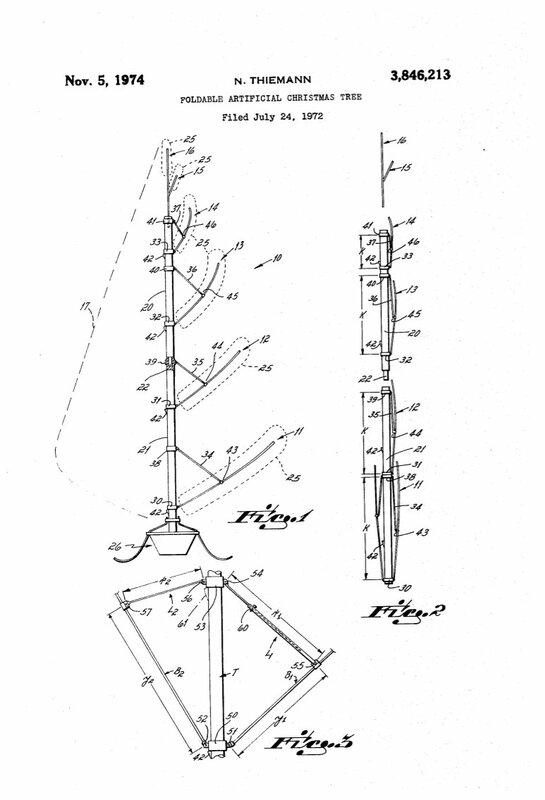 A quick search on The Google tells me some enterprising chap patented just what I was thinking back in 1974. 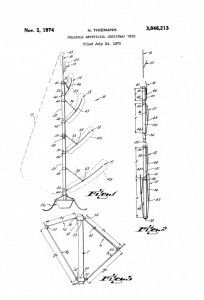 Norbert Thiemann came up with a collapsible Christmas tree and was granted U.S. patent 3846213. I’m not aware of Mr. Thiemann’s invention actually being used anywhere. Cheap Thoughts: a new role for the U.S. Postal Service? Speaking of antiquated ways of doing things, I’ve often wondered if the U.S. Postal Service might be better off transitioning to more of an IT role. Perhaps it could rebrand itself as a Information Delivery or Information Directory service and deliver both hardcopy (i.e., mail) and softcopy (i.e., email,fax,etc.) materials to Americans. I’ve often wondered if it should play the role similar to IANA in routing traffic on the Internet. I’ve also thought before that the postal service missed an opportunity to take on the directory role by providing each American with a free .us email address. The postal service has long been an information delivery service, it’s just that now an increasing amount of this delivery is taking place on the Internet. Could the USPS one day deliver packets the way it now delivers packages?